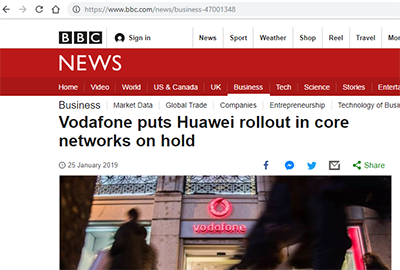 Vodafone is pausing the further rollout of Huawei equipment into its European core networks, including in the UK, according to the BBC. The chief executive of Vodafone said that the company is engaged in discussions with various security agencies and with Huawei, which "is really open and working hard" to resolve the matter. Huawei has been a close supplier to Vodafone since 2007. Ericsson's overall sales for Q4 2018 increased by 10% YoY to SEK 63.8 billion (US$7.06 billion), while sales adjusted for comparable units and currency increased by 4%. Gross margin rose to 25.7% compared to 21.6% a year earlier. Gross margin, excluding restructuring charges and other costs related to revised BSS strategy, improved to 36.3%, supported by cost reductions, the ramp-up of Ericsson Radio System (ERS) and the contract review in Managed Services. "Our focused strategy has yielded clear results. Ericsson is today a stronger company. Increased investments in R&D for future growth, managed services contract reviews, combined with efficient cost control have proven to be successful, with improved competitiveness and profitability as a result. As the industry moves to 5G and IoT, we will now take the next step, focusing on profitable growth in a selective and disciplined way. Sales have gradually improved during 2018, resulting in full-year organic sales growth for the first time since 2013. This is partly due to an improved market, but also driven by market share gains in Networks as a result of a more competitive radio product portfolio. " Networks sales adjusted for comparable units and currency grew by 6% YoY. The company notes high business activity across multiple regions, including a recovering RAN market as well as strong performance in the product portfolio. Growth was partly due to a higher than anticipated activity level in North America driven by increased 5G demand among the US operators. Networks gross margin improved to 41% (35%) YoY, mainly due to improved hardware margins driven by the successful shift to Ericsson Radio System (ERS). Strategic contracts and 5G field trials had a negative impact on operating margin in the quarter. R&D investments continued to grow in the quarter, but are now expected to flatten out. In Managed Services, gross margin improved to 12% (-5%) YoY, supported by efficiency gains and customer contract reviews. We have now addressed all 42 targeted contracts, resulting in an annualized profit improvement of SEK 0.9 b. Digital Services sales adjusted for comparable units and currency grew by 5% YoY. Digital Services operating income, excluding restructuring charges and costs related to revised BSS strategy, was SEK -0.6 b.
Ericsson also noted that it continues to cooperate with an investigation into its compliance with the U.S. Foreign Corrupt Practices Act (FCPA). NTT Communications introduced a toolkit that provides real-time connectivity between its Enterprise Cloud WebRTC Platform Skyway (Skyway) with a variety of cloud services, including voice recognition artificial intelligence (AI), machine-translating AI and live transmission. The new Media Pipeline Factory will offer six kinds of built-in components that can process recording, voice recognition and machine translation without the need for programming. It integrates Skyway's voice and video data services with AI and cloud offerings such as NTT Com's natural language analysis AI engine COTOHA Virtual Assist, which enables those without knowledge of Japanese to communicate in the language. NTT Com said its kit simplifies the expansion of WebRTC functionality and extends the areas in which voice and video data can be leveraged, allowing clients to accelerate their digital transformation. Open Fiber, a wholesale-only player in the Italian broadband market, selected Nokia for a fiber-to-the-home (FTTH) rollout covering small towns and rural areas of Italy. Specifically, Nokia has been selected as the sole supplier for clusters C and D (white areas) under a broadband plan drawn up by the Italian government. Nokia will deliver products, services and software needed to plan, design, deploy and support the end-to-end active network infrastructure based on GPON technologies. Financial terms were not disclosed. Stefano Paggi, Network & Operations Director at Open Fiber, said: "We have selected Nokia as our supplier in clusters C and D to deliver giga-services and pave the way for future ultra-broadband technology evolutions. With Nokia's solutions we will be able to offer services at 10 Gbps and in the future at 40 Gbps on the access network. We will also have the opportunity to adopt the SDAN (Software Defined Networking) paradigm and therefore to maximize the potential of a new generation access network, with high automation, programmable and integrated with cloud environments." Keysight Technologies demonstrated maximum achievable 5G New Radio (NR) data throughput performance using the company’s 5G NR network emulation solution, which is based on Keysight’s UXM 5G Wireless Test Platform, and Samsung’s 5G NR Exynos Modem 5100. The joint achievement marks the successful completion of full stack interoperability and development test (IODT) based on the 3GPP 5G NR release 15 specifications. The demonstration utilized 256QAM and 4x4 MIMO (multiple-input multiple-output) technology to verify maximum achievable data throughput rates. Vantage Data Centers completed its previously announced acquisition of Canadian-based 4Degrees Colocation from Videotron for approximately US$200 million (C$259 million). 4Degrees operates two facilities in Montreal and Quebec City. The two data centers are Tier III Design and Construction certified, which highlights the facilities’ exceptional quality and reliability, by the Uptime Institute, an independent organization. Vantage plans significant expansion projects in both markets to accelerate 4Degrees’ original plans to bring total capacity up to 31MW. Guavus has acquired SQLstream, a real-time streaming analytics start-up based in San Francisco. Financial terms were not disclosed. SQLstream offers suite of high-performance, low-latency, and low-cost edge data collection and smart mediation products. The solutions are used for real-time data quality assurance and competitive price optimization, real-time travel-time services integrating sensors with smartphone applications, traffic congestion detection and prediction for ‘smart city’ initiatives, real-time emergency services dashboard and alerts, and continuous data quality assessment and correction for IoT devices. Their customer list includes companies such as Walmart, Cisco, and Amazon AWS, which licensed the SQLstream technology for use within AWS Kinesis Data Analytics, powering the applications of thousands of AWS customers. Guavus said the deal helps it to expand its offering, providing communications service providers (CSPs) and Industrial Internet of Things (IIoT) customers access – at the network edge – to real-time, cloud-enabled streaming analytics to address their growing big data needs. 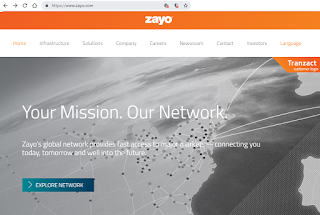 Zayo Group was selected to provide an E-LAN solution to an Internet analytics and cybersecurity firm. 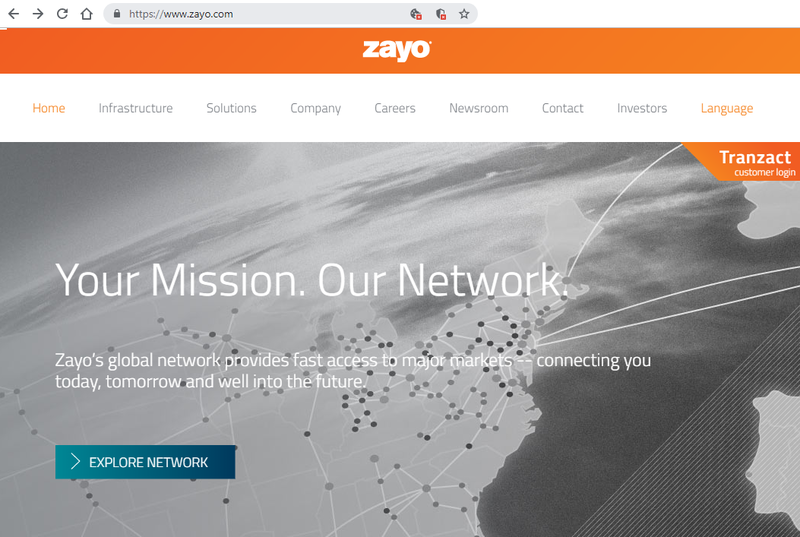 Zayo said the diverse solution leverages its network across the U.S. and Western Europe.